Uplinks are simple upload portals that you can set up to upload directly into your account. Uplinks can be utilized by both users and non globaledit users. Begin by logging into your account with your username and password. Next, click the Manage tab at the top of your screen and select Uplinks > Add New Uplink. Next, you can either select an existing Job for the uploader to upload to or create a New Job. Once you have selected a destination folder, click Next. Now you can specify an Uplink name that pertains to the shoot; something that the recipient will recognize. In the Uploader field, add a user or an email address to send to guest uploader. Here you can also add a note to the recipient, as well as set an optional expiration date. Once you have completed this step, click Next. Once you have set up your sender and destination, you have the option to pre-enter all the metadata for the shoot, or you can set it so that the uploader must enter the metadata on their end. You can also choose to set the file naming convention for the uploader. 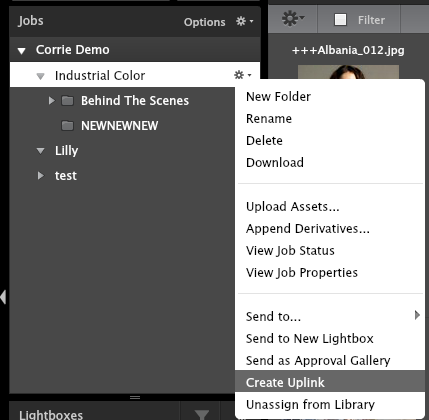 Choose "Set file naming convention" on the Uplink page. Once check-marked, you can enter in the naming convention. During the Uplink upload transfer, you can see the uploaded files as they come through. To preserve the file order, we only rename files when the Uplink is complete so users can see the original file name come through for a small period of time. If an Uplink file conflicts with an existing file in globaledit, we will increment the filename until it's possible to not conflict. If a user uploads the same assets twice in the same uplink, they won't be counted as duplicates and will be renamed as unique assets. After clicking Next you will be prompted to fill out and customize the default email that will be sent to the recipient. Once this is filled out, click Next and you will be shown a summary of the Uplink you have created. To complete this, click Send Uplink and you are done. Use one-click Uplinks when you need to quickly grant an individual access to upload into your account. Enter the username or email address and press send. By default, one-click Uplinks will have no expiration date, will not require users to enter metadata, and will not force a file naming convention. You can still access customized permissions by clicking "Customize Uplink", which takes you to a page where you can setup metadata requirements, change the name of the uplink, force a file naming convention, add CC recipients, or write a custom message.